The finals of the annual Forum Discussions were hosted on 17 August by Settlers High School, after preliminary rounds at Springfield Convent and Herschel. The preliminary rounds were won by Reddam House College and Herschel, and the three top teams from the preliminaries went through to the finals: Settlers, DF Malan, Rustenburg Girls’ High, Westerford, Herschel and Reddam. The winning teams on the preliminary and final evenings each receive R 1200 for their school libraries, and there are cash prizes for the individual winners. This will take place at Pinelands High, Forest Drive, Pinelands on Wednesday 31 August, 5.30 for 6pm. Guest speaker: Award-winning playwright and scriptwriter Karen Jeynes. History is repeating itself! For the past three years the order of the top four schools in the competition has remained the same: Springfield Convent, CBC St John’s Parklands, Sans Souci and Westerford. Well done to these schools for the sustained excellent record. We have retained the same word list over this period, but this year set a rather tricky test and the mean error rate was the highest of the three years, although the proportion of learners with more than 20 errors does seem to have decreased a little. Those with fewer than 5 errors did really well and deserve acknowledgement although just missing certificates, which go to the top spellers with full marks or a single mistake. Congratulations to Sans Souci, which had the highest proportion of certificates, with 25% of their entrants gaining awards. The larger schools and those with a diverse language intake face the greatest challenge, and it is clear that some learners have difficulty in following the questions as read out in the test, although we attempt to make the sentences appropriate to the age level. Both are quotations from recent issues of the Cape Times, illustrating the failure of computerised spellchecking and the importance of context. In the recent competition a number of learners were trapped by the sentence ‘The judge convicted the gang members of illicit diamond dealing and sentenced all of them to a fifteen year jail sentence’ and wrote variations on elicit. Other common mistakes were a superfluous i creeping in after the v in mischievous and, surprisingly, the fairly common word ‘thorough’ was a great challenge. ‘Occurrence’ proved tricky to many, and ‘eliminate’ was often rendered as a variation of ‘illuminate’ although this would have made no sense in context. We recommend that you set the test again for your learners when you have looked at the marks they achieved, and see if they have retained their ability to spell the words given and their ability to understand their meaning. Perhaps ask the good spellers to create the test with the same words in different sentences, but making clear their meaning, which would also strengthen comprehension. Thank you for entering your classes and for all the effort of preparation. (Please see the overall results below). 17 schools initially entered for the competition: 16 wrote on the assigned day, Wednesday 19 March. The total entry of learners was a little over 2250, with Grade 8 enrolments varying in number from 220+ to 48. Class sizes varied between 19 and 39, and this is without taking into account the wide diversity of language backgrounds often present in a single class, despite the learners being designated as English First Language. We are very mindful of these challenges to educators. However, the standard all will eventually need to face is that of matric, when scripts will need to pass muster, As you probably know, in the UK there is now a special government-backed effort to improve the standard of English in schools, and examinees who make significant errors in English will be marked down heavily in public examinations, even if their work is factually correct. South Africa must drastically improve levels of comprehension and writing skills in English if our young people aspire to become world citizens, and we warmly acknowledge your active support of your learners and efforts on their behalf, and particularly in entering them for Spellcheck. The table below displays the 2016 results, and Springfield Convent, the present holders of the SACEE Spelling Competition picture, must be congratulated on an outstanding achievement in recording an average of less than 3 errors per learner. CBC St John’s Parklands has demonstrated a consistent commitment to Spellcheck, improving year by year, and their efforts have been rewarded by second place. The schools recording an average of fewer than five errors (80% correct) are doing exceptionally well, and Westerford’s tally of 52 certificates must be a record, particularly for a school with a grade enrolment of over 180. Sans Souci, with a high proportion of learners for whom English is not truly a first language, deserves a special mention for its success. We suggest that you re-run the test after an interval of about a month, and mark it in class, correlating the marks with those received in the competition. This will demonstrate whether learners have retained their ability to spell the chosen words correctly. Most of the vocabulary should have been familiar to this age group, but words such as ‘meagre’ and ‘nutritious’ did pose problems, perhaps associated with pronunciation. It may also be interesting and informative to retain these Spellcheck marks and to correlate them with learners’ literacy assessments in Grade 9. Pictured: Grade 1 pupils from Factreton Primary School. This project involves 5 schools with 3 or 4 readers at each school. These ‘Rambing Readers’ continued their weekly reading programme for Foundation Phase primary school learners throughout 2014. 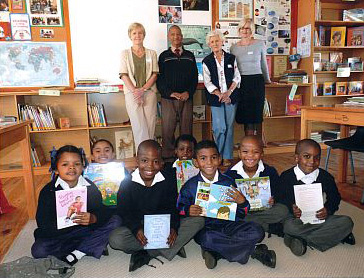 The volunteer readers read to Grades 1,2 and 3, usually for about 30 minutes per class, with teachers present. Lively and colourful books are chosen, with a view to improving comprehension, vocabulary and pronunciation, but most of all to encourage a love of books and the exercise of the imagination. The branch is always looking for more volunteer readers. No previous experience in schools is necessary, but a clear reading voice with good projection and a genuine liking for children are desirable. Schools participating in this programme have shown improvement in literacy rates as measured by the official ANAS testing. For further information phone Delia Scott on 072 342 0755 or Terrill Nicolay on 082 762 0460. This competition is designed for learners in the first year of high school, and is intended to improve not only spelling capacity, but also vocabulary through teaching words in context. When a school enters, ALL Grade 8s must participate, to encourage team effort and spirit. Teachers also have the opportunity to diagnose learner difficulties at an early stage of high school careers. The 50th edition of English Alive will be launched in Cape Town later this year. Please refer to the project page of this website for a full report of the launch. The foremost national anthology for high school writing in English, ENGLISH ALIVE has been published in hard copy annually for over 49 years, giving many South African writers their first opportunity to appear in print. Such people include, Kelwyn Sole, Jeremy Cronin, Henrietta Rose-Innes and Nicholas Spagnoletti. Contributors can submit work independently of their schools and there is no charge for submission. The First closing date for submissions for ENGLISH ALIVE 2017 (which will be launched in August 2017) is Wednesday 1 April 2016. The Final closing date for submissions for this publication is 1 May 2016.